Our nudie SurfGroms holiday and term programs are the perfect way to keep your groms active, healthy and social while learning life long surf and ocean awareness skills. Groms from 5 to 12 years old can participate in our holiday 4 x 2 hour lessons or our term 3 x 2 hour lessons feeling a sense of achievement as we cater for 5 levels from absolute beginners through to intermediate surfers. Our programs provide fun and motivating beach activities, games and lessons in a safe environment with our professional team of coaches. 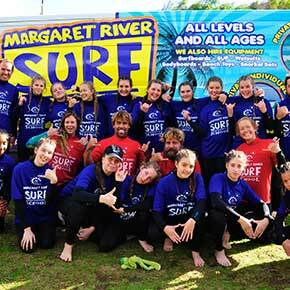 All nudie SurfGrom coaches hold a current Working With Children’s card, Senior First Aid and Surf Rescue Certificate. All equipment is provided and every nudie SurfGrom who signs up will receive a great Rip Curl backpack bursting with surfing merchandise including a rash-vest, towel and a logbook. Check out available dates below and book now to secure your groms place! We put the kids in the SurfGroms program over the Sep/Oct school holidays and they had a blast ! The surf coaches were amazing with the kids and we will definitely put them in again when we’re down there. Groms from 5 to 12 years old can participate in our holiday 4 x 2 hour lessons or our term 5 x 2 hour lessons feeling a sense of achievement as we cater for 5 levels from absolute beginners through to intermediate surfers. Our programs provide fun and motivating beach activities, games and lessons in a safe environment with our professional team of coaches. All nudie SurfGroms coaches hold a current Working With Children’s card, Senior First Aid and Surf Rescue Certificate. All equipment is provided and every nudie SurfGrom who signs up will receive a great Rip Curl backpack bursting with surfing merchandise including a rash-vest, sun screen and logbook. Check out available dates and book now to secure your groms place!